January 11, 2018 at 8:31 pm. KICKOFF: Saturday,8:15 p.m. ET, Gillette Stadium, TV: CBS, Jim Nantz, Tony Romo, Tracy Wolfson (field reporter), Jay Feely (field reporter). SERIES HISTORY: 42nd all-time meeting. Patriots lead series, 24-16-1, and the teams have split two playoff games. The Titans have never won at Gillette Stadium, with some memorable losses marking their shortcomings. They lost 59-0 in 2009, tying the most lopsided loss in NFL history in the process. Also, the Titans lost in the 2003 playoffs in one of the coldest games in playoff history, 17-14. KEYS TO THE GAME: This may be a matchup between the talent behind two Heisman Trophies on one side and the aura of five Lombardi Trophies on the other. The biggest drama may be to contrast and compare the instinctive abilities of multitalented young Titans quarterback Marcus Mariota, who seems to be on the ascent (hey, he threw a touchdown pass to himself last week), against the pre-programmed, computer-like efficiency of Patriots quarterback Tom Brady, who, at 40-years-old, insists he is not on the decline. There are plenty of other factors in this melodrama, like Titans running back Derrick Henry, the teams’ other Heisman winner, and Patriots tight end Rob Gronkowski, who wreaks havoc in a style reminiscent of an escapee from Jurassic Park. –One or more Titans vs. Patriots TE Rob Gronkowski. The Titans probably would not have defeated the Chiefs if Travis Kelce did not leave with a concussion. The Titans had several different players try their luck with the Chiefs’ tight end, with little success. 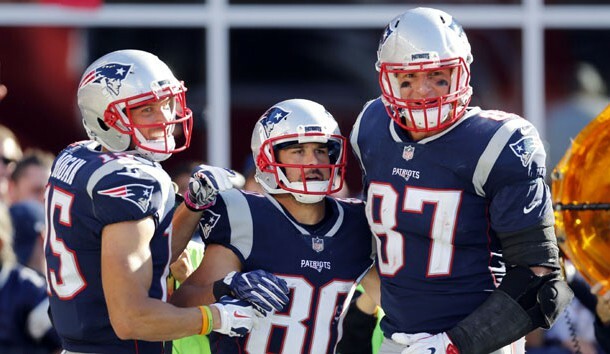 Gronkowski could be even more of a nightmare matchup. Someone from among Kevin Byard, Jayon Brown, Wesley Woodyard and Johnathan Cyprien — maybe even two of them — will have to slow down Gronk. Byard had 10 takeaways during the season with a league-high eight interceptions. — Titans QB Marcus Mariota vs. Patriots defensive coordinator Matt Patricia. The Patriots’ defensive coordinator might employ a spy on a healthy Mariota, who suddenly rediscovered his mobility. If that happens, Mariota must make the Patriots pay by winning one-on-one battles in the passing game. PLAYER SPOTLIGHT: Marcus Mariota for the Titans. His grit and determination played a huge role in his recent success highlighted by the return of his danger as a dual-threat. That could become the one factor that not even Belichick and Patricia can overcome with one of their schemes aimed at erasing the opponents’ key weapon. FAST FACTS: Titans — QB Marcus Mariota passed for 2 TDs last week, including the one he caught himself off a ricochet. He is one of only five QBs in NFL history with at least 9,000 yards passing (9,476) and 900 yards rushing (913) in first three seasons. Since entering league in 2015, he has 40 TD passes vs. ZERO INTs in the red zone … RB Derrick Henry rushed for 156 yards and a TD last week, joining Eddie George (1/16/2000) as only players in team history with 150-plus yards rushing in postseason game … RB DeMarco Murray, whose 5,614 yards rushing since 2013 is 2nd in league, will miss his third straight game with a knee injury, sustained in loss to the Rams on Christmas Eve, but may return if (big if) the Titans advance to the AFC title game … TE Delanie Walker led team with 74 catches, 807 yards receiving … LB Wesley Woodyard led team with career-high 121 tackles … S Kevin Byard tied for league lead with 8 INTs … DT Jurrell Casey’s six sacks marked fifth consecutive year with at least five and led team with a dozen TFL. Patriots — QB Tom Brady is all-time postseason leader in career passes (1,325), completions (831), yards passing (9,094) and TD passes. So, no surprise he is 25-9 (.735) as postseason starter. He led NFL with 4,577 yards passing this year … RB Dion Lewis led team with career-high 896 yards rushing. In last postseason game (SB LI), RB James White set single-game SB record with 14 catches and scored three touchdowns … Rob Gronkowski led all NFL TEs with 1,084 yards receiving … S Devin McCourty led team with career-high 94 tackles … DE Trey Flowers make 2.5 sacks in SB LI … CB Malcolm Butler has 7 PD and INT in last six postseason games … LB James Harrison, former well-known Steeler until he was cut three weeks ago, had 11 career postseason sacks, tied for 5th most in NFL history … K Stephen Gostkowski made 22 consecutive FGs in postseason, 2nd longest streak in NFL history. PREDICTION: It took tremendous persistence and some good luck for the Titans to win at Kansas City last week. Even with — or perhaps because of — some real or imagined snit among Belichick, Brady and owner Robert Kraft, the Patriots will just do their job, and that should be enough to burst the Titans’ bubble.